On the 150th anniversary of Lincoln's speech, will the real Gettysburg Address please stand up? Nov. 19, 2013, is the 150th anniversary of Abraham Lincoln’s Gettysburg Address. Or, to put it another way, the best-known American speech is seven score and ten years old. Although it’s famous, familiar, and was often memorized by school children (schoolchildren in the North, that is), the text of the Gettysburg Address is uncertain: we all know the words, or many of them, but it turns out that there are many Gettysburg Addresses, not just one. There's just no one hundred percent accurate record, spoken or written, of exactly what Lincoln said that day. You can see the original Declaration of Independence at the National Archives, along with the handwritten copy of the Constitution as approved by the Constitutional Convention, and the handwritten draft of the Bill of Rights. These are original, authoritative versions of America’s founding documents. But even though its history was much simpler—Lincoln wrote most of his short speech in Washington, revising it in Gettysburg the night before the dedication of the National Cemetery—we have five different versions of the Gettysburg Address in Lincoln’s handwriting, each slightly different, along with printed versions that appeared in newspapers, versions also showing variations in the text. And, of course, there are no sound recordings of Lincoln’s speech. Lincoln was actually the second speaker at Gettysburg on November 19. The president received his invitation to participate just two weeks earlier, a good two months after Edward Everett, the former Massachusetts politician and acclaimed speechifier, was invited to give the keynote address. Everett’s “Oration” lasted over two hours, so even if reporters did have tape recorders, their batteries would have gone dead by the time Lincoln took the podium. The president we might call 16 today was a minor player at the ceremony, asked to give only “a few appropriate remarks,” and so he spoke for a little over two minutes. But although Lincoln said “The world will little note nor long remember what we say here,” his words are burned into the American consciousness, while we have to check Wikipedia to find out what it was that Sen. Everett talked about. Sometimes less is more. Even for those Yankees who didn’t master all 273 words of the Gettysburg Address in elementary school (or all 239 words, or all 266—the number of words varies with the version), some of Lincoln’s phrases have proved memorable. “Four score and seven years ago” may be the speech’s most-widely repeated phrase, along with much of the first paragraph of the speech, though it’s likely that many people who quote it aren’t sure what a “score” is and so have trouble translating four score and seven into “real” numbers. that government of the people by the people for the people, shall not perish from the earth. This is often changed to “the government of the people, by the people, and for the people." The New York Times pluralized it, "governments of the people . . . ."
Despite variations in the text, these are lofty words, a lot loftier than, “Mr. Gorbachev, tear down this wall” (said by Ronald Regan, sometimes called the “Great Communicator”); or, speaking of Berlin, “Ich bin ein Berliner” (said by JFK); and “I am not a crook” (said by Richard M. Nixon, though nobody believed him). Of course not everything in the Gettysburg address is inspiring. Lincoln also said things like “This we may in all propriety do,” the least quotable of the speech’s sentiments. When presidents write their own speeches, some words are going to be duds. In fact, some of Lincoln’s critics thought his whole speech was a dud. The Harrisburg, Pennsylvania, Patriot & Union called the president’s words “silly remarks” that deserved a “veil of oblivion. . . dropped over them” (150 years later, the paper printed a retraction). Editorial in the Harrisburg, PA, Daily Patriot and Union, Nov. 24, 1863, dismissing Lincoln’s remarks as silly and worthy of oblivion. It’s generally agreed that Lincoln read from what is called the Nicolay Copy of the Gettysburg Address, the copy he gave to John Nicolay, one of his private secretaries. The first page of the Nicolay copy is written on White House stationery (the White House was then called the Executive Mansion), suggesting it's Lincoln's first draft, and the second page is written on plain lined paper. The pages have been folded, which could mean that Lincoln kept them in his pocket and took them out to read. Both pages show corrections and edits that Lincoln made, presumably before he read the speech. An excerpt from the Nicolay Copy of the Gettysburg Address, in Lincoln’s handwriting, written on official stationery. The two pages have been folded, which could mean that Lincoln took them out of his pocket to read from. It is rather for us, the living, to stand here dedicated to the great task remaining before us. It is rather for us, the living, we here be dedicated to the great task remaining before us. It is for us, the living, rather to be dedicated here to the unfinished work which they have, thus far, so nobly carried on. Above: Two images from the Nicolay Copy, showing this passage with Lincoln’s revision, extending from the bottom of the first page to the top of the second page. Below: the Hay Draft with yet another version of the same line. It is for us, the living, rather to be dedicated here to the refinished work that they have thus so far nobly carried on. The New York Times front-page report of the Gettysburg Address ran the next day, Nov. 20, 1863. The text, which includes the phrase “under God,” shows a typo, refinished for unfinished, and minor differences from other versions of the speech. We here highly resolve these dead shall not have died in vain; that the nation under God shall have a new birth of freedom, and that government of the people by the people for the people, shall not perish from the earth. Neither the Nicolay nor the Hay manuscript has the words “under God,” so Lincoln may have ad libbed them. Whether or not he said it, “under God” became part of the standard text of the address, and the words are carved in stone on the Lincoln Memorial. 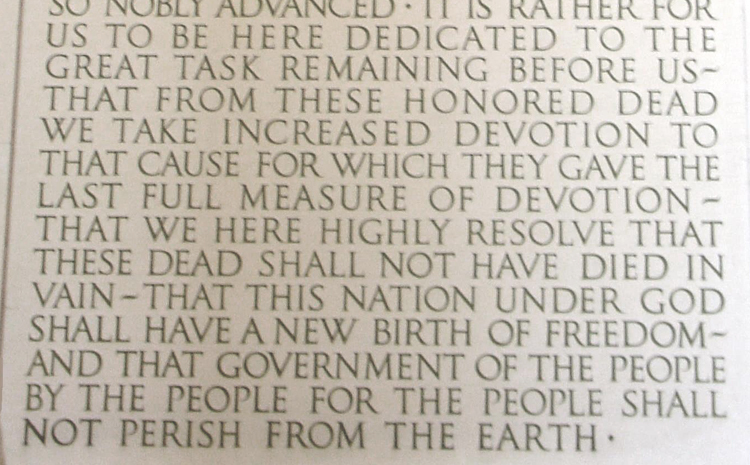 The version of the Gettysburg Address carved on the Lincoln Memorial. In the end it doesn’t matter that there’s no definitive Gettysburg Address. We have no definitive text of Shakespeare’s plays or Chaucer’s poems, either, relying instead on composites of the multiple versions of the texts based on the best guesses of scholars and editors. And although viewers of Law and Order are convinced there’s one and only one Miranda warning, in Miranda v. Arizona (1966) the U. S. Supreme Court refused to require a single, specific formula to embody the right to remain silent, warning that formulaic expressions quickly become empty expressions. As a result there are actually hundreds of different Miranda formulas in the American criminal justice system. governments of the people, by the people and for the people, shall not perish from the earth. Excerpt from Lincoln’s speech, as printed by Edward Everett in 1863. 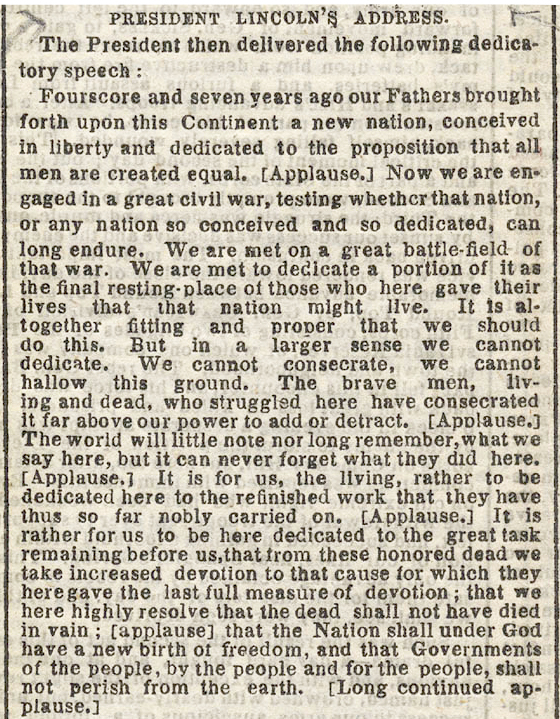 A final note: Lincoln’s Gettysburg Address is in English. Supporters of a law to make English the official language of the United States insist that American ideals, as expressed in documents like that speech, as well as in the Declaration of Independence, the Constitution, the Star-Spangled Banner, and "Mr. Gorbachev, tear down this wall," can only be understood in the common language that binds a diverse nation together. But English didn’t keep the United States from splitting apart in 1861, and English didn’t bring the Union and the Confederacy back together after the war. Military action and the rule of law did that. The fact that Southern children did not have to memorize the Gettysburg Address in school has nothing to do with the language it’s written in, and everything to do with the perception among those for whom the Civil War never ended, that the ideals expressed in Lincoln’s words were unacceptable in any language.